David and Marianne are made for each other in so many ways, and their lives continue to intertwine as husband and wife, parents, grandparents, sculptor and painter. It’s why, when David was asked to carve a panel for an East London church, he knew just the person he wanted to work with to bring the project to life. Marianne painted in the characteristically bright colours she uses in her abstract paintings, and highlighted the scripture in gold. The work was so well received that they were commissioned to create 14 more panels, depicting the Stations of the Cross. Reflecting on his interpretation of the Last Supper, David decided to show women because “even though it's supposed to just be the 12 Apostles, I'm certain there were women there”, and Marianne agrees: “As I say, who actually wrote the New Testament? So, good for you”. 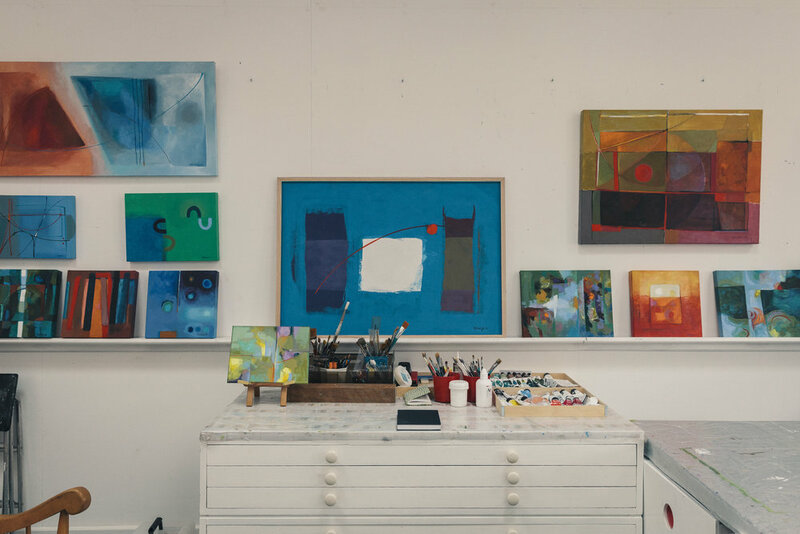 This wonderful ability to consider the overall picture and think beyond the immediate is apparent from the moment we meet David and Marianne at their shared studio. Here, they tell us about their influences, and the increasing importance of traditional crafts in a contemporary world. DAVID: I'm a sculptor and I also design the layout in churches. Nothing must be superfluous. It must be necessary. I was working on a church and one of the people there said: 'My daughter's getting married next year and I don't like to see just an ordinary chair being used—would you be interested in doing marriage chairs?' And I said, yes. MARIANNE: They're beautiful. They're some of the best pieces of furniture he's made. MARIANNE: My mother was a sculptor, and I wanted to be an architect; but, architecture is a long study course and there was no way of having any money for that kind of thing. So, I went to art school and did sculpture. We had a wonderful sculptor master, but he left to go to Camberwell, in London, and the bottom fell out of my world because the other teachers were stuck in the late 19th century—with no sense of anything having happened since then. I thought, well, I'll do some painting. And then, once I got into colour, I couldn't stop. DAVID: My father used to make model planes to fly, which was very different to the work he was doing for Shell—he was a manager in Haiti, the Dominican Republic, Puerto Rico, and Jamaica. 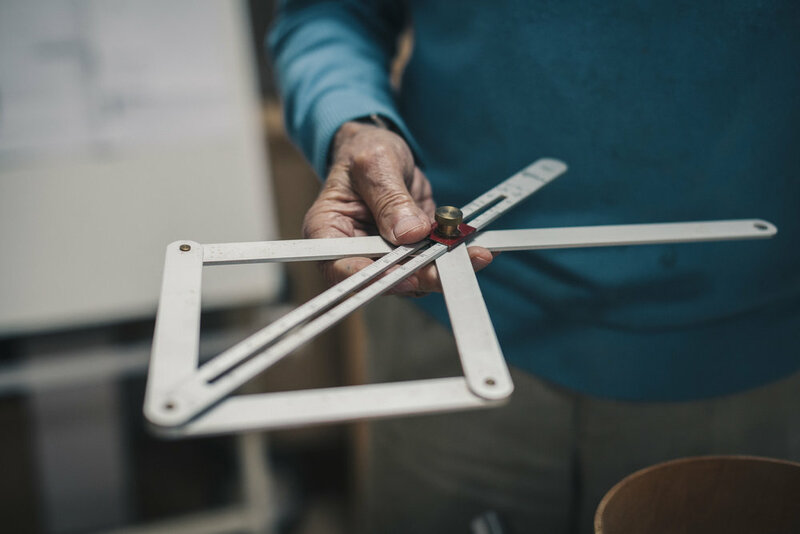 He once asked me to shape the front part of the aeroplane, and said, 'Oh, you can do this much better than I can', which was incredible encouragement. And then he used to get me to paint the Shell signs for the petrol stations. Years later, when I was a student in South London, Wimbledon, I met the son of the man who designed that sign. DAVID: My childhood in the West Indies. There was a great sense of community, helping each other. My parents were forward thinking as well. For instance, we talked about what I was going to do, and my father said, 'You're drawing, painting, 24 hours a day—that's your great love, isn't it?' He wasn't of a background of artists or anything like that, so just very helpful. MARIANNE: In 1939, my two sisters and I were evacuated to Edinburgh, and we went to a boarding school there. Unfortunately, my mother, who had been widowed four years before, didn't get out of Holland. She was there looking after her parents, and by 1940 the Nazis were over there so that was that. The thought of being dispossessed, in a sense, made the beauty of Edinburgh overwhelming. You know, the castle on the hill, the water so near, and Princes Street and the beautiful gardens below. As an eight-year-old, I thought it was wonderful; it was like a fairy tale, despite the fact of everything else. MARIANNE: I have times when I don't paint at all. I spend time in the garden, which is as creative as anything else I do. Then, other times I write; but I always come back to painting. I think it’s a need. MARIANNE: That's a big difference, yes. DAVID: And I had good fortune. I was 25 when an architect in Liverpool, who was originally from Chile, asked me to help with some quite big stone carvings, ending with one having several figures. MARIANNE: Do you know, I don't think that you or I thought it was at all extraordinary. Here was an architect saying, 'would you do this? ', and it seemed quite obvious and natural that you would do it. DAVID: Yes. I never asked him, 'Why did you ask me to do it? ', but I was in constant work for him. MARIANNE: I think the best occasion was our son Simon's 6th birthday party. The small boys watched these three huge blocks of stone being lifted by a brightly painted red and yellow crane. The girls didn't think much of it, but the boys did as the new crane looked so like a toy. It was just very funny—I've never forgotten. MARIANNE: I don't think you can call it philosophy, but my work is to do with balance and colour. Most of my paintings have straight lines because I need things held safely. Thinking about it, with six children, I was often confined to the house looking out the windows and doors, and I think that's where I get the framework from. And, as many people do with photographs, they set a frame, and I think it's the same kind of thing—to give a sense of distance. DAVID: In my case, it's feelings that I relate to, I suppose. Teaching, communicating, and having faith with a strong element of narrative. A painting that I did when I was a boy I’ve since translated into John the Baptist. He was an extraordinary figure, living on almost nothing and, in a way, I'm sort of dedicating and honouring this man. He was clearly in another world. It was all based on a memory. A memory of this man because we used to see him in the market. What place do makers have in the modern world? MARIANNE: An important place, which isn't really recognised. So much depends on design, but people don't always know that this is part of their lives. That is why a maker’s place is still very important, without it being understood. DAVID: Yes, it's non-mechanical. The actual making is like a fulfilment. You fulfil an idea and, if it works, people will appreciate it. I mean, Marianne, she did a wonderful painting for the back of a church, for the front of the altar, and after some months the priest goes, 'I'm terribly sorry, but you're going to have to take this painting away’. MARIANNE: So, we had to drive all the way up to Wakefield to collect it. It was no longer behind the altar, it was in a sort of communal area. And when someone came in and saw us taking it out, she said, 'What are you doing with our painting?' It was too late—I had an exhibition in Switzerland. DAVID: I happened to go for part of the exhibition to support Marianne. A very elderly woman came over, humming and so on, and said, 'I feel so young’. And that's a fantastic response to Marianne's colour. MARIANNE: Then, the painting was bought by a Jewish banker in Paris. So, okay, it's somewhere. I was bemused that a Jewish person would have a Christian icon in a way! DAVID: Ultimately, that painting went to the right place. Named after the couple’s home, Belvedere Studios is nestled at the end of David and Marianne’s garden, with its own entrance area to welcome guests and visitors. David designed separate spaces for both of them. Marianne’s side of the studio is bright and colourful, and David’s is filled with tools and saws. The studios are connected in the centre by a hallway and bathroom (the space is also used by family as a guest bedroom and en suite). MARIANNE: The sheer size is a great pleasure. It’s marvellous to have this space and be able to stand back from what you're doing, and seeing it in different lights. One of the best things is that I have a sink in here to stop the acrylic paint from drying on the brushes. That is a fabulous extra. Plus, the fact that I can have a kettle and coffee in here. It’s also wonderfully useful for meetings with other painters. I work with a group of poets, and so we have workshops in here in the winter, and that's a great thing. DAVID: My workshop is the dusty area, with chips and noise. MARIANNE: Yeah, and on concrete. MARIANNE: It's bad for you. DAVID: And in the garden. I was once doing quite a big stone panel and I just leant it against an apple tree, in all weathers, trying to carve. So, this is a tremendous boost. MARIANNE: These are the tools that my mother used. This is the most precious thing. It's absolutely lovely. It's a little thing, but it means a lot and I use it in my own work. MARIANNE: I painted this when we went to visit our eldest daughter and her family when they lived in the south of Portugal, in the Algarve. I love the brilliant colour of the sky. DAVID: These are some of my measuring instruments. They are simple things, but genius. This thing is cast in bronze and I made it on that lathe. It was quite a thing because I had to draw in the pieces and there was always the danger that, if it got caught, the power of that machine is such that, unless you're very careful, it could explode into pieces. And there is the three-legged support and those are fabricated. This is quite precious to me. It's a beautiful piece, if I may say so.